New England Fall Foliage - "Must See's"
Why a Northeast US Fall Foliage Vacation Site? This web site is the result of 30+ years of my Wife and my travels to some great Affordable Pennsylvania Poconos and New England Mountain Fall Foliage Vacations. Our New England Fall Color Vacations have most been to the New Hampshire White Mountains and western Maine White Mountains Fall Color Viewing areas including the popular colorful Kancamagus Hwy 112 Fall Foliage Viewing drive. We have done much searching and planning for "must see" places of interest and great attractions to squeeze in during an always too brief vacation week or 10 days. We have our Fall Vacation Attraction "Must Sees" plus brief "Reviews," Admission Fees, Time needed, and Tips we have discovered -- some the expensive hard way -- posted here with more to come. Also some discounted or sometimes even "cheap" Attraction and Vacation Rental finds. We have checked out many Fall Foliage Vacation local attractions and points of interest, as well as taken many Day Trips to nearby attractions + Mountain Fall Foliage Viewing road trips with lots of pictures. We have "Reviewed" our "Must Sees" and others here for you so you won't need to make some of the wasted drives to not-so-great attractions we have made. We also show you lots of pictures to help you make up your own "Must Visit" list. Of particular interest to those watching budgets (most of us!) are often the money saving Travel and Attraction Reviews and Discounts, Vacation Resort Condo Rentals and Reviews + Time Share Vacation Rental Reviews -- all with Discount Tips. We will even have some special Tips here for the growing "over 50" crowd which we have been members of for several years. We have done Interval International (II) and RCI Time Share condominium exchanges and Vacation Resort Condo Rentals (which any NON timeshare owner can rent!) as a result of some Timeshare weeks we have owned in Florida for 30+ years. We have learned many Tips from our 30 years of Timeshare vacation exchanging and vacation rental experiences which will be shared here - so you don't have to make some of the expensive mistakes we have made!. $$ Tip - Vacation Time Share Condo Rentals are often available at significant discounts -- and are available to NON-time share owners as wall as owners IF you can find them. We have learned some helpful sources to find available Timeshare rentals which will be on some upcoming Time Share Exchanging and Rental pages. Check back for new additions. We will try to share many valuable Vacation Planning and Attraction money-saving Tips and Discounts -- and sometimes expensive mistakes -- that we have learned during those over 30 years of Vacation Planning and actual Vacation Travel, Lodging Rental, and Attraction experiences. My Wife and I have both made extensive use of online Info sources for vacation planning for several years. She likes to check out good local Attractions - (and Quilt Shops in the area) -- and I like to research Historical Sites, Resorts, and Bed & Breakfasts - plus local Restaurants. (Gene really gets into the Restaurant "research" - especially the onsite testing!) We have area Attraction and Restaurant "Reviews" here now and more will be added. So lets get to it. -- "Tips to help you Plan & Save + Pictures to help you Dream"
Pennsylvania Weekend Getaways + Pocono Mountain Weekend Getaway Deals. Affordable Weekend Getaways in the Pennsylvania Poconos including some deals on Romantic Mountain Getaways. Our Viewers Best Pocono Mountain Vacations - Where they Stayed, Played, Drove, and Dined. "Raves" & Reviews from our Site Viewers. Share your own Best Poconos Vacation with our Site Viewers! Our Viewers Best New England Fall Vacation Stories - Where they Stayed, Played, Drove, and Dined. "Raves" & Reviews from our Site Viewers. Share your own Best New England Fall Vacation! 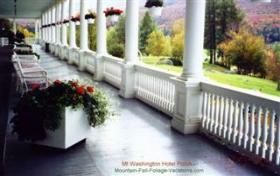 Historic New Hampshire Mt Washington Hotel - New Hampshire Vacation Resort Rentals Option (And Day Trip "Tour" Attraction) - nearby area Fall Foliage Vacation Scenic Day Trips, NH Fall Foliage Attractions and Colorful White Mountain Fall Foliage Viewing Drives. Delaware Water Gap - Pennsylvania Pocono Mountains - Vacation Attractions - Scenic Fall Foliage Day Trips, Tips. Fall Foliage Maps - New England White Mountains and Pennsylvania Pocono Mountains Peak Color Predicted Date Maps plus Current Fall Foliage Peak Color Reports and Foliage Map updates. Now have Links to individual Regions of Current Fall Foliage Maps for New Hampshire Including White Mountains + have Maine Peak Color Fall Foliage Maps. Historic Gettysburg Battle Picture Album and Battlefield Pictures + Gettysburg Cemetery, & Amish Buggy - horse drawn with turning lights pictures / desktop wallpapers / downloadable screensavers. Has link to free Previews of over 80 selected high resolution downloadable Photos from all three of our "Picture Enhanced" US Vacation Sites. New England Fall Foliage Picture Album - Screensavers / Wallpapers page - approximately 5 x 7 size free downloadable and printable versions of most pictures on this page + some other favorites. Can now do Previews of selected high resolution downloadable Photos from all of our Vacation Guide Sites. Other Top Vacation Destinations + Affordable Vacation & Travel Resource Links + Link to Us & Link Exchange. Our Site Users Best Fall Vacations & Attractions in Northeast US - Raves, Rants, Reviews, Stories, & Pictures - Categorized listing of User "Reviews." See our "basic" 9 page GoUSAbeaches Site with many photos. Includes many Pictures and Comments from some of our favorite previous USA Virginia, Oregon, and Florida Beach Vacations -- plus some "Historic" Road Trip Vacations to US "History Lover" Points of Interest and Attractions. and to view our newest Fall Foliage Picture Albums! Please send us any Comments or Suggestions you might have for this Affordable Fall Foliage Vacations Guide Site to us on our Comments, Suggestion, & Favorites Input Form. If you have any personal Northeastern US New England Fall Foliage Vacation and Travel or Affordable Attraction Favorites -- with or without colorful Fall Foliage Pictures that you would like to share, please send them using our Comments & Fall Vacation Favorites Form above - or use the Facebook Comment Form below.